Canning fruits and vegetables is not just a skill; it's a time-honored tradition. 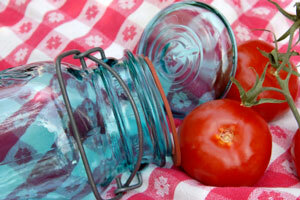 Linda shares the canning skills she learned from her grandmother - editor. When I was a little girl, my grandmother wanted to teach me everything she had learned in her youth. She felt that her life was simple and free of all the complicated distractions of the modern world. One of the lessons she taught me was how to can fruits and vegetables. Although the methods change slightly as time goes by, the idea is still the same. It is a great way to preserve fresh fruits and vegetables without sacrificing the nutrients or taste. My grandmother was very serious about her canning. In her kitchen, hygiene came first. Jars and lids were sterilized in boiling water for thirty minutes. The fruits and vegetables, fresh from her garden, were thoroughly cleaned. She normally used boiled water to preserve vegetables and homemade juice to preserve fruits. After she filled the jars, she always let me pour the liquid in. This was my shining moment, because it seemed to be the most important part. Each type of produce needed a different amount of coverage. Grandma made sure I never poured too much or too little. She told me the fruits and vegetables needed room to dance. Once the lids were on, Grandma did the sterilizing. She put the jars into a huge pot of boiling water for varying amounts of time. When I was younger, I didn't understand the details, so she made a list of food types and time requirements. Grandma explained that these jars would last an entire year and save the family tons of money. Once I became an adult, the concept of canning my own produce seemed old-fashioned. But when my daughter was born, I decided to pass the knowledge on and let her decide if she wanted to use it. Teaching her in the same manner my grandmother taught me was a lesson in itself. It reminded me that the art of canning isn't old-fashioned, it's time-honored. To this day, my daughter and I make preserves together once a year. It helps us appreciate that we are responsible for our individual livelihoods, whether we buy food at the market or grow and can it ourselves.